This book is designed to take the reader through three real world examples of solving business problems using Microsoft SharePoint 2010. Rather than just pointing out the features of SharePoint the reader will be taken through three step by step tutorials that each solve a basic business need. The book will show reader how to add and delete SharePoint content, complete some elementary branding, work with the more advanced features of document libraries and more. 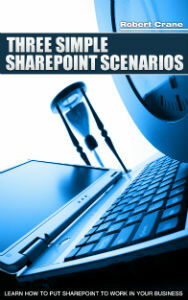 If you are keen to move beyond what SharePoint is to what SharePoint can do for business then this is book for you.